Step 1 In a heavy-bottomed sauce pan, heat vegetable oil over medium heat. Add the mustard seeds and asafetida. When the mustard seeds begin to pop, add the rice vinegar, tomato, curry powder, fenugreek, ginger, garlic, turmeric, cayenne, cumin, coriander, mace, sugar, salt and raisins. Stir together and bring to a simmer, then reduce the heat and gently simmer until the liquid reduces and the mixture thickens slightly, 15 to 20 minutes. Remove from heat and cool, then cover and refrigerate until needed. This makes about 1 1/4 cups chutney. In Recipes-list.com we have selected the most viewed recipes from category - Sandwiches Vegetarian . Enjoy the best recipes specially selected for you! 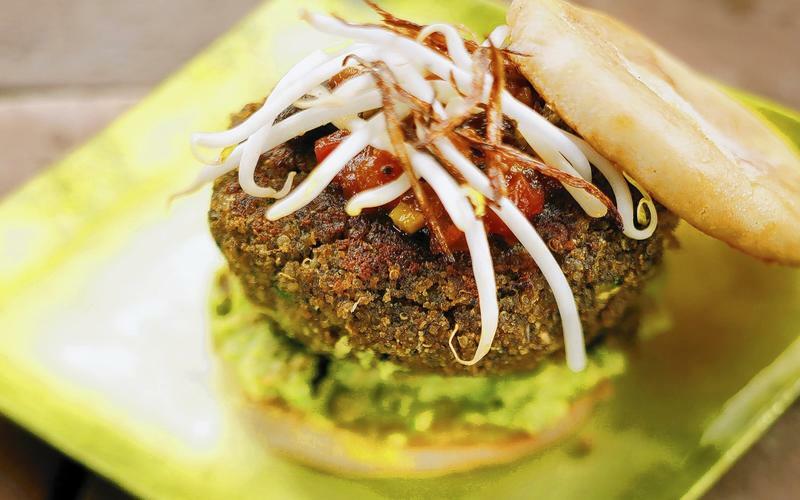 Cafe Pasqual's quinoa burger is the right choice that will satisfy all your claims.